Sometimes I can't help but wonder if a certain level of indifference has crept into music because of the technology of the twenty-first century. Back in the day (not necessarily my day! ), artists and labels told you what order tracks should be listened to because vinyls and cassettes couldn't be shuffled. These days, I for one tend to listen to an album a couple of times straight through and then it stays on shuffle. Read More Sometimes I can't help but wonder if a certain level of indifference has crept into music because of the technology of the twenty-first century. Back in the day (not necessarily my day! ), artists and labels told you what order tracks should be listened to because vinyls and cassettes couldn't be shuffled. These days, I for one tend to listen to an album a couple of times straight through and then it stays on shuffle. 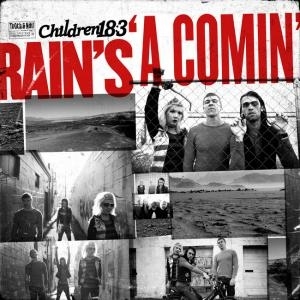 Rain's A Comin' is the second release from American punk band, Children 18:3 and is a classic example of this track listing indifference. The title track opens the album weakly and, in my opinion, should not have opened the album. The gang vocals and chanting really didn't sell it for me. Luckily, I wasn't put off and carried on listening to what turned out to be a pretty strong album. There are moments where the vocals aren't incredibly sophisticated but there is a certain charm to them that makes them work. Some of the gang vocals I could do without but on the whole the charm carries them through. This is the kind of music you don't expect from the Christian scene and I love that! There is awesome musicality, great lyrics and an energy which is infectious. Little surprises, like the awesome guitar intro to Stronger, keep the album interesting. It begs for the open road on a sunny summer's day, air-conditioning on and the stereo up full volume. It's a shame the album gets off to such a weak start, if it were my choice I would have switched the first and last tracks. The Last Laugh is a wonderful tribute to the old silent movie soundtracks and would have started the album of with a lot more promise - but all in all a good album.